As the Okanagan’s premier sports and entertainment venue, we’re pleased to offer you three methods of purchase! Online, in person and over the phone, for your convenience! Also, for your ease will call tickets are available for pick up two weeks prior to the event or concert. These can be picked up at the Valley First Box Office (at the SOEC). Please bring your photo ID, confirmation number and credit card used to purchase. Will Call tickets: Available for pick up two weeks prior to the event. 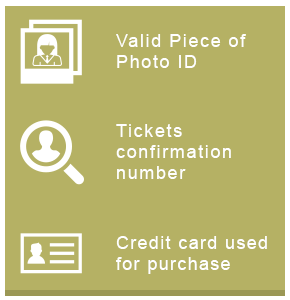 Must present photo ID, confirmation number and credit card used to purchase.